A section of the travelling support chanted "Warnock, time to go" during the defeat as striker Ross McCormack was the latest to miss a clear chance. "Unless I run on the pitch and put the chances in myself, I don't know what to do," Warnock said. "It's frustrating. "It's often glass half empty at the club and it should be glass half full." Since beating Tottenham in the FA Cup last month, Leeds have now lost to Cardiff and Middlesbrough without scoring, as well as being held to a 2-2 draw by Wolves. They are eight points behind the play-off places with 15 games remaining. 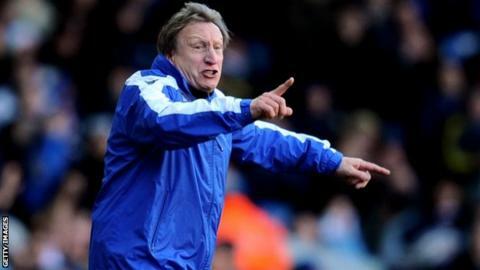 And while Warnock feels his strikers are to blame, he also reacted angrily to questions over the sale of 19-goal top scorer Luciano Becchio to Norwich in January. When it was put to Warnock that he last month sanctioned the sale of Becchio, he said: "That's a ridiculous statement. "But it's frustrating. The last three open goals (in games against Cardiff, Wolves and Middlesbrough) are not difficult chances. I thought Middlesbrough were there for the beating. Without Luciano Becchio, Leeds are short of goals. El-Hadji Diouf (above) and Michael Tonge are now their top scorers in the league, with four goals each. "We had a great opportunity to take the lead and don't know how we didn't take it. We should be talking about three wins and be right in there." and he vowed to fight on despite crowd unrest. He said: "Its a natural thing. If we'd have taken that first chance they would have been chanting our names. "It disappoints me when I see some of the comments but you can only do your best as a manager. I think we've had a good season. "We've beaten Everton, Tottenham and Southampton, and run Chelsea close."